I didn't mean to fall off this page, but I'm back, and back from NYC, too. As much as I didn't want to fulfill the stereotype of annoying So-Calers complaining about the east coast's freezing cold weather, I very much did that and started counting the days to home upon the first day there. New York has all of its charm, yes, but it's liberating being able to wear whatever the hell you want at (almost) any given time here in LA. Sartorial freedom is what I call it- and this here is a perfect example of that. A composite made of different textures that may not go together at first glance, but are put together anyway: a pebbled leather jacket made thick for great winter wear, a grungy holed-up tee and suede camo shorts (from The Dreslyn) appropriate for warmer days... complete with a studded leather clutch, huge black frames, and bare legs. Sartorial freedom, I'm down with that. Such a great jacket and purse! You look fantastic! beautiful, I love that jacket! You look FAB! I love the pebbled leather jacket!! If you're complaining about the weather in NYC you'd definitely be complaining a lot more if you were in the UK! rain, hail and wind! Complete nightmare! his jacket is perfect! And I love your army shorts! Huge change from NYC attire I'm sure. It's complete departure. Hope you enjoyed other aspects of NYC. When it's inhospitably cold it's very hard! Love these CAMO shorts! such a very cool outfit! This look is amazing, i love that acne leather jacket, the leather is so cool! I adore this jacket though I am quite jealous that you still get to wear whatever you'd like even though it's mid winter. I need that jacket, it is gorgeous! i LOVE this outfit on you! the jacket is perfection. I'm with you on the weather thing babe. It's pretty hard to beat LA kind of temps. Loving this entire combo on you! 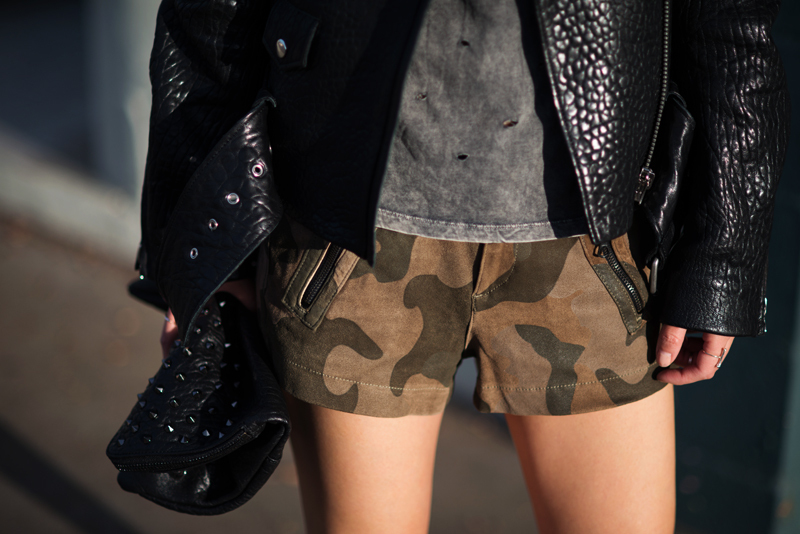 the camo shorts and leather jacket are killer! Is there a jacket more perfect than this? Love this look --especially the shorts! Cali living is so so tempting right now, could you do a post to show us what it's like to live there?